Apply one ml. twice daily directly onto scalp for best results. I love this product, my hair was beginning to get very thin and you don't realize what a big deal hair is, until your losing so much of your own. I started using the Keranique shampoo daily and the conditioner (2 days a week, the conditioner dries my hair out. 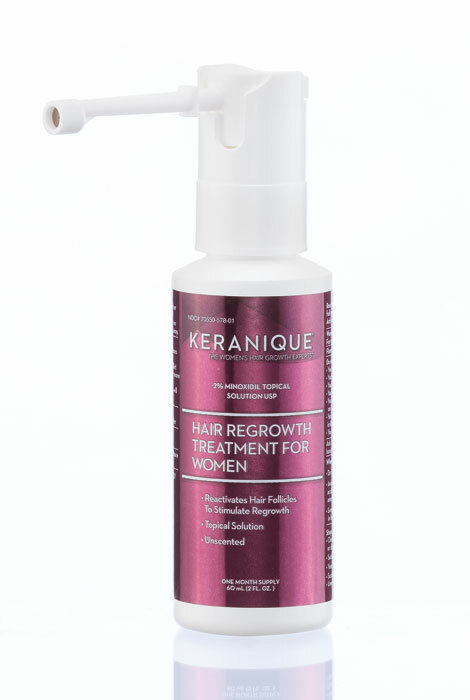 I use the regrowth spray every morning and massage my scalp and I have so much re-growth you would never know I was having any issues at all prior to using Keranique products. Yes, I recommend this product to everyone, even people I do not know that are in the same aisle looking for a good product and after I tell them my story they purchase the product. I've been using it for 7 months and I have a full head of hair and the shampoo honestly makes your hair grow. I will never stop using this product. Please NEVER STOP MAKING THIS PRODUCT LINE. I GIVE IT A MILLION STARS! I use it every morning after I wash my hair. My hair is so much thicker and longer, shinier. I really like it. I've been using this product a year & noticed significant hair growth along with the rest of the line of products with it. I became ill a year ago & losing weight &'hair were symptoms of it. I bought the entire keranique line of products & use them everyday. My hair hascthickened quite a lot & I'm still ill! Very happy with this. I use this product twice a day without fail .just spray , massage in weak area of head where needed style hair and go. Applicator is much too hard to use for my arthritic hands. Do not need child-proof applicator here - no children. Please give us a choice when ordering - "child-proof or NOT child-proof!" Otherwise, as my condition worsens I won't be able to use this product. I chose this product because it works for me. My hair loss has not reversed but it has stopped. Also, some other brands use a foam, and Keranique is an easy spray. This has made me hair loss come back to life. It really works. Been using for years and love it. It really does make your thi hair look fuller. I know this brand is reliable and according to other reviews it really works. I was losing my hair, I shaved my head. I decided to regrow my hair. The middle of my hair wasn't growing as fast as the sides, so I tried Keranique . My hair is growing and I am very happy with this product. I will continue to use this product. I will tell my friends all about it. I have a friend who uses this product and has tried several other hair regrowth treatments. This one actually works for her. This product is for thinning hair. That's why I chose it. My hair is thining out at the temples. Because it keeps my hair growing. And it actually works! Trying to keep my hair healthier, first time trying this product. This works!! That is all I can say! Spray on 2 times a day. Doesn't interfere with hair products and it works. I have tried the Keranique Shampoo & Conditioner and find them to be wonderful. I am very pleased with the body that my hair has and I would like to try the Hair Regrowth product as well to see if it will help with some thinning of my hair. Have used this product before. It is good for thinning hair as you age. Desparate for help with thinning hair! My hair has thinned out a lot. I noticed new growth in my hair but I also started taking Biotin supplements with it. BEST ANSWER: Thank you for your question. Yes, this item should help grow hair back in bald patches. We hope this information will be of help to you. Do you wash your hair after applying this? BEST ANSWER: Thank you for your question. Most of our users of this product typically wash their hair and then use it as a leave in before or after styling. We hope this information is helpful. The bottle says to leave it on for 4 hrs. I put the product on after washing my hair and style as usual in the morning then reapply it at night and wash my hair the next morning. IS ONE SPRAY ONE ML.? hOW LONG DOES ONE CONTAINER LAST? Is this a product that once we start, we have to continue, like Rogaine? Yes it is and it's made with minoxidil. Customer Service number does not go through can you help me ? is this product for hair breakage also? BEST ANSWER: I don't think so. It is for re-growth after hair loss and contains Minoxidil. Would this be helpful for thinning hair not necessarily balding areas by still applying to the scalp? Thank you. BEST ANSWER: Thank you for your question. Yes, this will help keep the hair you have. We hope this information will be of help to you.